Recent work in the Billinge group has led to the derivation of the fundamental equations of magnetic pair distribution function (mPDF) analysis, in analogy to the more familiar atomic PDF. 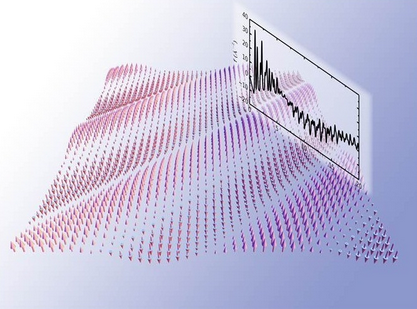 This breakthrough provides a new way to quantitatively investigate local magnetic correlations and has the potential to be extremely valuable in a diverse range of materials, including high-temperature superconductors, spin liquids, molecular magnets, nanomagnets, and so forth. Because of the potential impact of our work, the editors of Acta Crystallographica Section A selected our paper as the first ever “Advances” article, a new designation reserved for articles that represent fundamental advances in the field. One of our figures (seen above) was also featured as the cover image for the January 2014 issue. This figure shows a spin-density wave structure with the corresponding mPDF in the plot inset. In addition, our article was highlighted in a “Scientific Commentary” article published in the same issue. We are excited about the publicity this work has gained and expect to see it used to make important progress in studies of magnetic structure. The January 2014 issue of Acta A can be found at http://journals.iucr.org/a/issues/2014/01/00/issconts.html, where the cover image can be seen. The direct link to our paper is http://scripts.iucr.org/cgi-bin/paper?S2053273313033081, and the commentary article is available at http://journals.iucr.org/a/issues/2014/01/00/me0534/index.html.